Great, Trey thought. I do one brave thing in my entire life, and now it’s like, ‘Got anything dangerous to do? Send Trey. He can handle it.’ Doesn’t anyone remember that Cowardice is my middle name? In the world Trey lives in, families are only allowed to have two children. Third children–shadow children–live in fear of being killed if they are discovered. Right after saving the life of Lee, another shadow child, Trey finds himself launched into another adventure. Lee is still in danger, and Trey joins forces with Lee’s brother, Mark, to try to rescue him. But when the Population Police catch Mark, Trey must come up with a new plan of action. Will he be able to rescue his friends? Or will his actions put all the shadow children at risk? 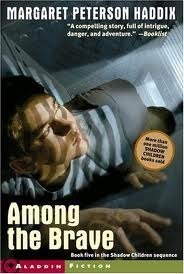 Among the Brave is book five in the Shadow Children series. Each book can be read separately, but I would recommend starting at book one and working forward. I chose to review this one because it happens to be my favorite. It took me a while to understand the world the shadow children live in, but after reading two books I realized that the population control concept is pretty similar to the one used in China. After making that comparison, the books made much more sense. All of the characters are relatable, and you’ll find yourself rooting for the third children as they fight to overturn the Population Police and win a place as legal citizens. thanks for doing the book review! I decided to try reading the series and they grabbed my interest.